At Kedron Veterinary Clinic, we are passionate about the health and wellbeing of your pets. Not only do we care for them when they’re sick or injured. We also want to make sure they can be found when they’re missing. That’s why we provide a fast, safe and life-saving pet microchipping service. A microchip is a tiny piece of technology and a form of identification that is injected underneath your pet’s skin. The chip is about the size of a grain of rice and it can be injected in a quick visit. Why is Dog Microchipping Important? Dogs go missing all the time. Unfortunately, missing dogs aren’t always reunited with their owners. An animal microchip is a permanent and unique form of identification that can help reunite you with your dog. There is a one-off registration fee, after which your dog is registered in the microchip recovery database. 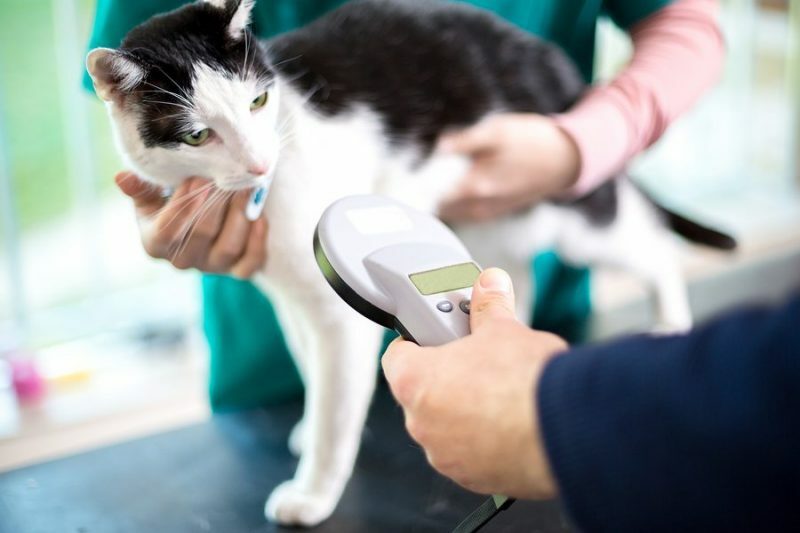 Microchipping makes it simple for vets, animal shelters and councils to contact the owner of a cat if it’s been found. It also helps protect your cat while also supporting you as the cat’s owner by providing piece of mind if you have a cat that likes to go on adventures. Cat microchips are dependable, unlike cat collars, which sometimes come off. What Is the Microchip Recovery Database? The microchip recovery database operates 24 hours a day, 7 days a week. When your missing pet is located, the database can access the owner’s contact information and reunite you with your furry friend. These services can also help if you lose your pet on the weekend. You won’t have to wait until Monday to be reunited with your four-legged companion. Once you have registered your pet, microchip recovery services are 100% free, ensuring affordable peace of mind. Our dedicated and passionate team provides fast, safe and permanent microchipping services in North Brisbane and the surrounding areas. Simply contact us today to make an appointment. The procedure is fast, 100% safe and no more painful than any other injection. Have you moved house or changed your phone number? If your contact details have changed, it’s important to update these details on the national database. You can change your details online free of charge. It only takes a few minutes and could save your pet’s life. To microchip your cat or dog in North Brisbane, contact Kedron Veterinary Clinic today. Call 07 3857 1785 or contact us online.